L.T. Graham is my pen name while I keep my identity under wraps. In reality, I am a New England-based suspense writer, and the author of several successful novels. 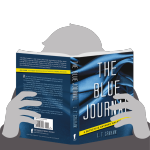 The Blue Journal is my first novel written under this pseudonym, and I am currently at work on the next Detective Anthony Walker novel in the series. Even though my identity is currently shrouded in secrecy, below I offer a few insights about my influences, inspiration, and writing process. These snippets are from recent interviews with Mysteristas and The Big Thrill. Do you have a signature accessory, phrase, or meal? What career or life experiences have influenced your writing?